The latest in forage preservation technique and innovation was discussed in Germany at the 2018 International Silage Conference (ISC). The conference was well attended, with more than 350 participants from 34 countries. 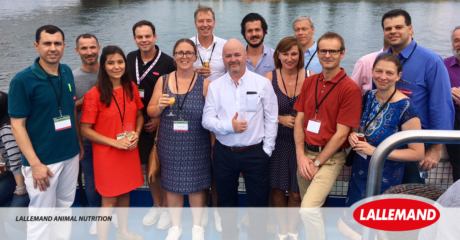 Lallemand Animal Nutrition led the way with almost 20 papers or posters presented featuring Lallemand products and technologies as well as the largest team of researchers and technical support staff present. Here are some highlights of the conference. What’s the latest on the inoculant front? There were a number of presentations about the positive effects of inoculants on silage quality or on specific parts of the ensiling process. Three meta-analyses showed microbial inoculation led to increases in milk production of dairy cows, even though some of studies had fermentation/nutrient parameters that did not differ between untreated and treated silages. Inoculation should result in improvements in feed quality — better dry matter recovery, lower protein breakdown and high digestibility — but it may also affect rumen microbiota by increasing microbial biomass and reducing methane loss. The next evolution of inoculants was highlighted with presentations on new bacterial species for aerobic stability and a bacterium + enzyme combination for highmoisture hay, which resulted in higher leaf retention, greater feed value and yield. The development of culture-independent techniques based on the analysis of nucleic acids in silage research has increased dramatically. Discussions from the essential questions in silage microbiology and biochemistry like ‘what microbial species and strains?’, ‘when and how?’ and ‘what sort of interactions and dynamics are present or have an effect?’ can now be better explained and further researched. For example, several abstracts presented showed that after inoculating with L. buchneri — a proven lactic acid bacterium that extends aerobic stability — the populations of spoilage yeasts and enterobacteria were lowered, the total population of lactic acid bacteria was higher and a more consistent microbial community was present especially when compared to the control treatment, in addition to a positive response in fermentation pattern. For additional cutting-edge technologies and new data in the silage-making industry, join us at the next ISC in China in 2021!